As expected, Estero and I woke up to lots of condensation this morning. 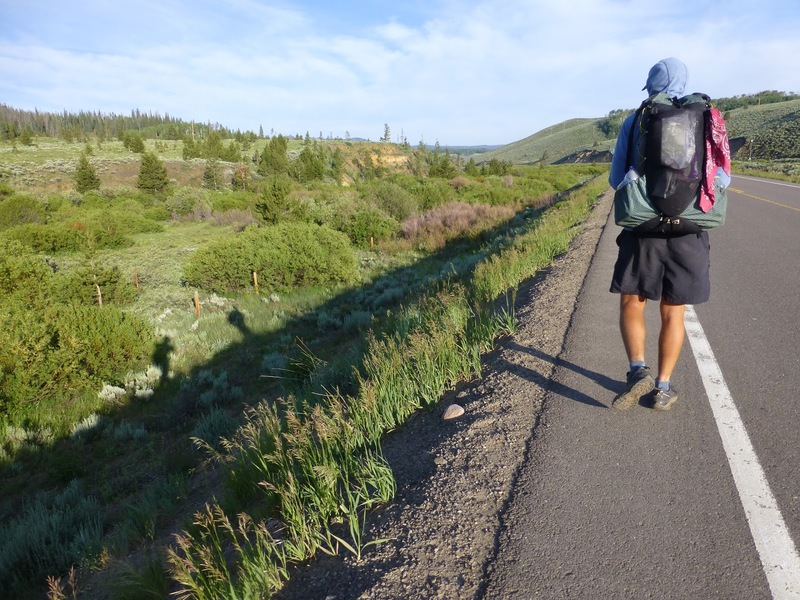 We were in prime condensation territory and knew better, but we had little choice as we had to camp off the highway and out of sight…so that ended up being down in a meadowy area near a wide stream in tall grass. What we didn’t expect was how cold it was! We were both warm in our sleeping bags and slept just great, but woke to a thick layer of frozen condensation inside our tents. I am usually very particular about my campsites and successfully went the whole hike without condensation until this morning, so I guess I was due. Good news is that we were headed to town and it would be easy to dry things out. 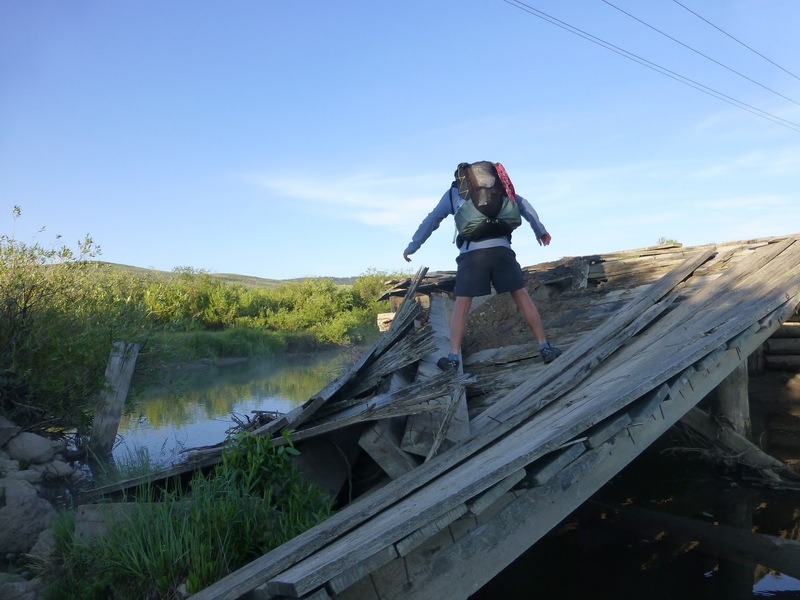 We started hiking by 6:45am and first thing was an old broken bridge. This is not part of the trail, but we had dropped down off trail to camp and chose to take this route rather than climb back up brush to the trail. It was a fun way to kick off the day! The road walk was 12.5mi long. We were very happy with our timing as we got to do this early in the morning when our feet were fresh, there were less cars on the road, and the temps were not hot. It was very exposed and I could imagine it being quite hot later in the day! In fact, it was below 40 degrees for the first hour, which was just shocking to us. A cold front must be coming through. It was a long walk, but a scenic one, so that helped. It was a welcomed change from the strenuous hiking we’ve had for weeks now. I was even able to get service and do my emailing and make some phone calls. The sun was on our backs the whole time, so my Suntactics sCharger-5 kept my iPhone over 80% the whole 12 miles! I also listened to a playlist a blog follower, Josh kindly sent me that had probably 200 songs on it. I am listening to them alphabetically and am in the S’s now. It would have been a perfect road walk if I hadn’t lost service the last hour or two when I hoped to watch a show or two. Almost fully wired! 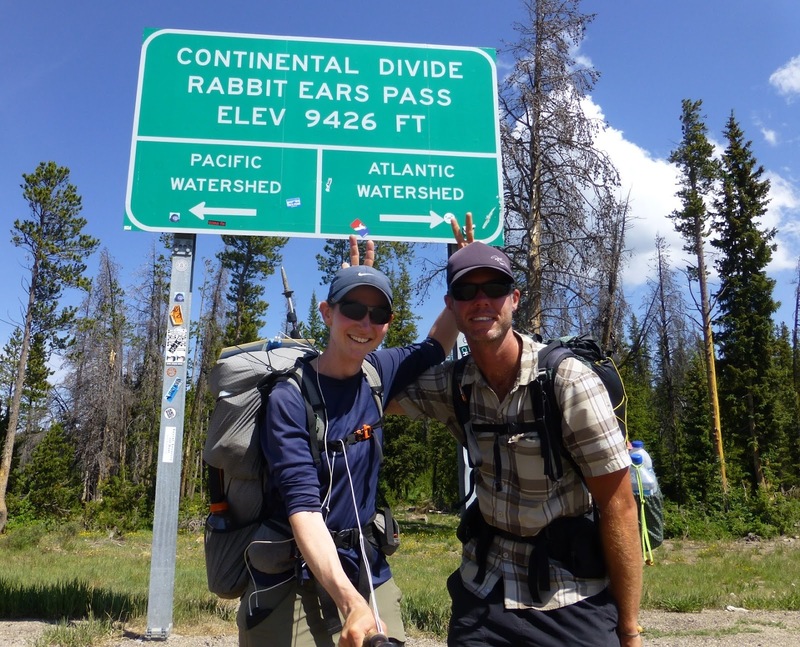 Yesterday we had a discussion over where the name of Rabbit Ears Pass came from. We imagined something visual that would indicate the pass. Toward the end of our walk, I noticed this formation on a ridge in the distance. 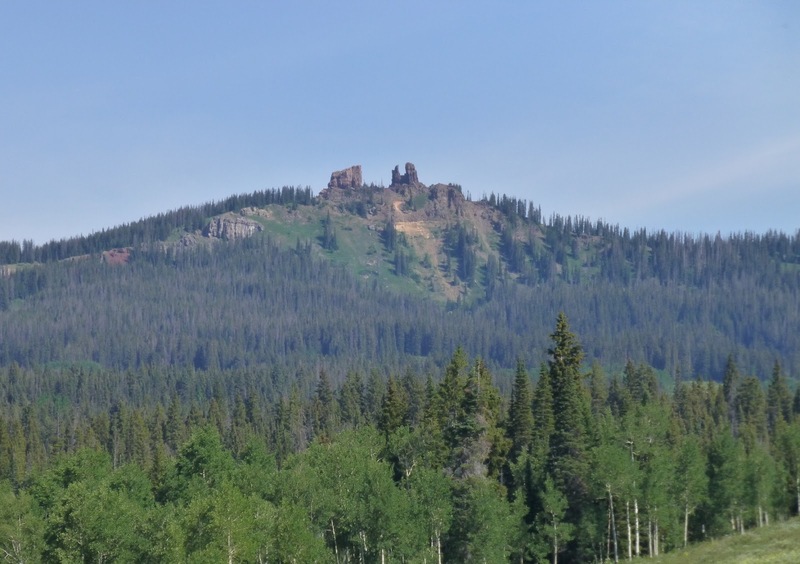 I used an app I have (PeakFinder) to find out what it was called and it was Rabbit Ears Peak. Pretty Cool! Estero and I couldn’t resist a bunny ears shot at the Rabbit Ears Pass sign. 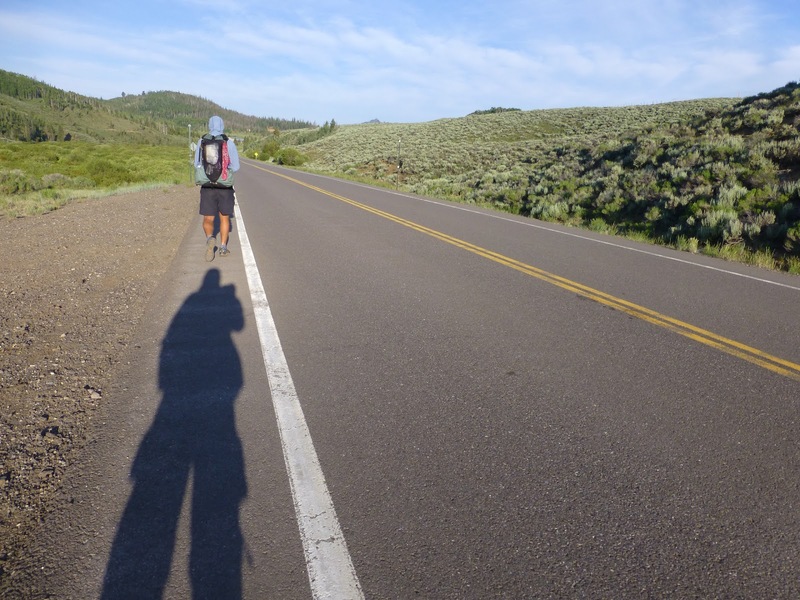 When we got to where we needed to hitch, it took us 45mins to get a ride, which is long for me as I usually get one pretty quick when I’m hitching as a solo girl. When we got to town, I was happy to see that we were right outside the stairway where I could lay my things out to dry. We were in town by 12:30pm and I started attacking my to do list as to earn some Hulu time tomorrow on my zero. I got a lot done and was very happy today! 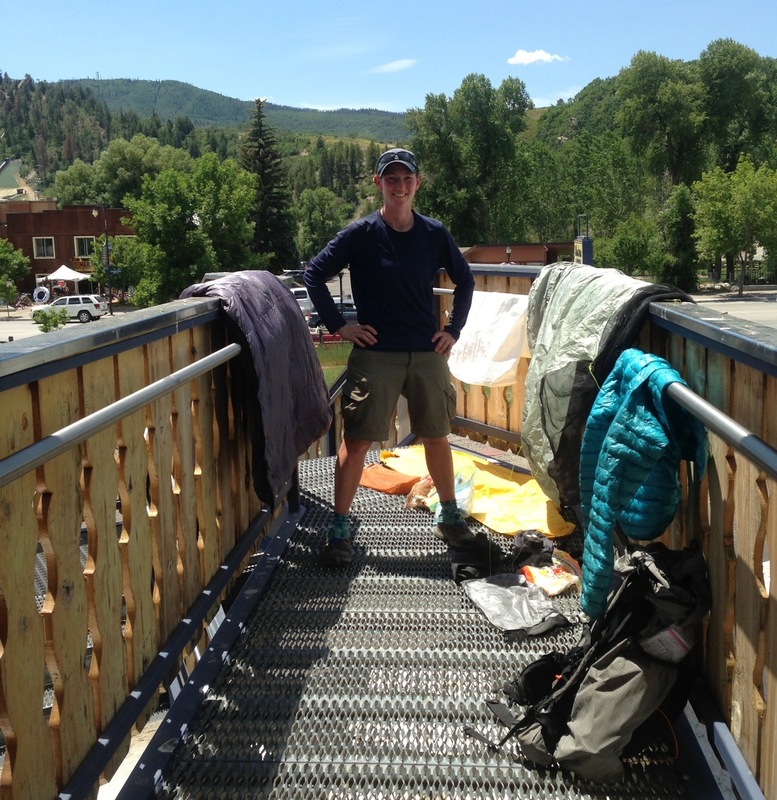 Another hiker named Flyby was in town and he and Estero chose to try to camp to save money and they will also be zeroing tomorrow for the Fourth of July. I ran all my errands and did what I could to eat as much as possible today. I am LOVING my first hotel room all to myself on this trip! This could be addictive! It is almost midnight now and I’m a tired camper…or moteler…looking forward to a productive day tomorrow and I better get time to watch some Hulu!